Crumble saffron threads into wine and let steep. In a heavy-bottomed stockpot, heat olive oil over medium-low heat. Sauté leeks with a pinch of kosher salt, about 5 minutes or until softened. Add garlic, fennel seeds and sliced fennel and sauté an additional 2 minutes, stirring. Add stock and simmer 5 minutes. Place monkfish pieces in hot broth and simmer for 2 minutes. Stir in shrimp and scallops and simmer until just cooked through, an additional 5-8 minutes. Stir in orange zest and season to taste with cayenne and kosher salt. Ladle into bowls, garnish with fresh basil, if using, and reserved fennel fronds. Pass the cayenne, pepper flakes or rouille. *If time allows, making your own seafood stock (or purchasing scratch-made stock from a vendor such as Monahan's or Whole Foods) is worth the effort. (See recipe below.) 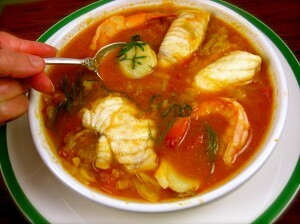 I have made and enjoyed bouillabaisse using bottled clam juice or mixing a seafood base (such as Better than Bouillon) with water for the stock. In a large, heavy-bottomed stockpot, heat the oil and stir in the fish bones and aromatics. Cook gently, without burning, 10 minutes. Add wine, bay leaf, garlic and enough water to cover the bones by an inch. Cover and bring to a boil over high heat. Reduce and simmer for 40 minutes. Strain stock with a fine-mesh strainer or a cheesecloth. Season to taste with kosher salt. *I used shrimp shells and a chopped monkfish spine (about 3 pounds total). Fish heads are fine for stock. Remove fish gills, and don’t use bones from oily fish, like salmon, as they deliver an off-flavor. Fish stock, unlike chicken or beef stock, only needs an hour to come together.